Back in America in the Sixties, John Ulam began his career in a factory, bonding carbon steel for use in weapons. By 1973 his life took another direction, and he founded his own cookware company: All-Clad. It’s a big leap, from making munitions to making cookware…but now, All-Clad is America’s favourite cookware brand, favoured by professional chefs and serious cooks all over the world. All-Clad’s Stainless Steel cookware collection is designed for everyone – from home cooks to professional chefs. It’s made from layers of magnetic stainless steel, 18/10 stainless steel and an aluminium core, which allows for quick and even heat distribution, and features riveted stainless steel handles for easy transfer of food from pan to plate. Each cookware piece in the Stainless Steel range is even individually polished by hand before it leaves All-Clad’s factory, so you can rest assured it’ll look very sharp while you cook. Constructed from three layers of metal – magnetic stainless steel on the outside, aluminium in the middle, and 18/10 stainless steel on the inside. Core is made from pure aluminium for ultimate conductivity, not just at the bottom of the pan, like most cookware, but up the sides too. This ensures your food is cooked evenly and quickly. Shiny 18/10 stainless steel exterior is polished by hand before it leaves All-Clad’s factory. Handles made from stainless steel, and are permanently attached to the body of the cookware with non-corroding rivets. Ergonomically designed for perfect balance and comfort. 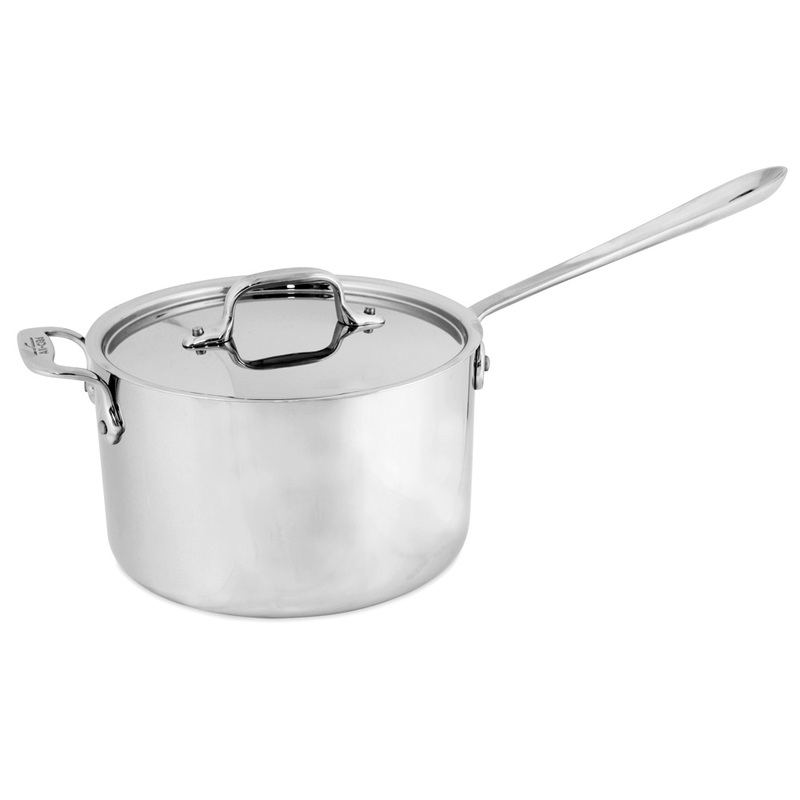 Matching stainless steel lid is designed to fit perfectly, thus ensuring heat and moisture stay inside. Suitable for all energy sources, including induction. Energy friendly - low to medium heat required only. Recommended for use with wooden or plastic cooking utensils. All-Clad cookware features stainless steel handles, which may become very hot during use – especially when used in the oven. Make sure you use an oven mitt when handling hot All-Clad cookware.